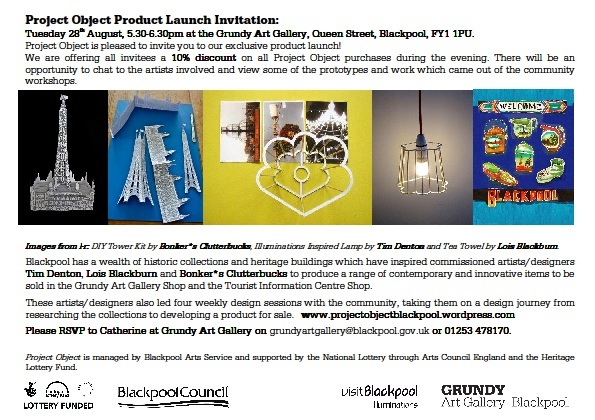 We are really looking forward to Project Object product launch tomorrow at the Grundy Gallery, Blackpool. Bonker*s Clutterbucks have taken part in the project along with designer Tim Denton and artist illustrator Lois Blackburn and have created products with the help of members of the community to be sold through the art gallery shop and tourist information shop, inspired by the city’s wonderful historic archive material. We are excited to be meeting the project apprentices again, seeing what Tim and Lois have created, showing our work and seeing all the work together in such a great art space.